A demonstrator holds a French flag as he demonstrates in Biarritz, southwestern France, Wednesday, Dec. 12, 2018. Storeowners are replacing shattered windows while city workers have been towing away the hulks of burned-out cars and cleaning anti-government and anti-capitalist graffiti off shops, buildings and world-famous sites like the Arc de Triomphe, which reopens on Wednesday, more than a week after it was vandalized. French President Emanuel Macron called Friday for calm as authorities prepared to deploy armored vehicles and thousands of security forces for a possible fifth-straight weekend of violent protests on the streets of Paris. 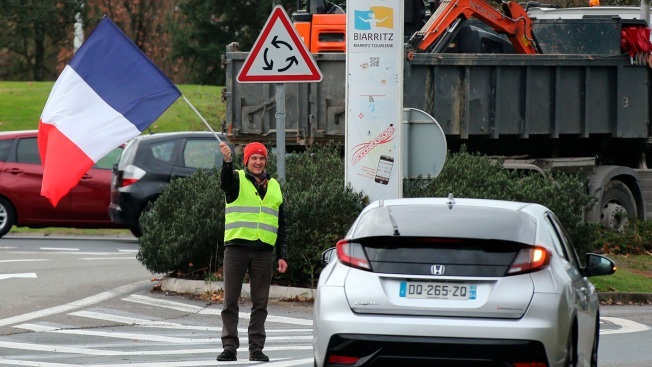 The "yellow vest" movement, which began its demonstrations Nov. 17 initially to protest an increase in fuel taxes, soon morphed into an expression of rage about the high cost of living in France and a sense that Macron's government is detached from the everyday struggles of workers. "Our country needs calm. It needs order. It needs to function normally again," Macron said in Brussels, where he attended a European Union summit. Macron acknowledged in a speech earlier this week that he's partially responsible for the anger displayed by the "yellow vest" protesters — whose movement takes its name from the safety garb that all French motorists must carry. He has announced measures aimed at improving workers' spending power. But he has so far refused to reinstate a wealth tax that was lifted to spur investment in France. "I don't think our democracy can accept to function with a dialogue that is carried out only with the occupation of the public domain, only by elements of violence," Macron said. He insisted he had heard the protesters' concerns and defended his promises to speed up tax relief. He has ignored calls for his resignation, which is now among the protesters' various demands. "Last week, we pretty much handled the 'yellow vests,' but we also witnessed scenes of breakage and looting by criminals," Delpuech said. "Our goal will be to better control this aspect." Amnesty International also urged authorities to use restraint, describing the security forces' response to the protests as "extremely heavy-handed." "Police used rubber bullets, sting-ball grenades and tear gas against largely peaceful protesters who did not threaten public order and the organization has documented numerous instances of excessive use of force by police," the group said in a statement. "Whilst policing demonstrations is a difficult task and some protesters have committed unlawful and violent acts, it is essential that both French law and international human rights law is respected," the statement quoted Rym Khadhraoui, Amnesty International's West Europe researcher, as saying. One group of demonstrators has urged a nonviolent protest on the Place de la Republique in Paris under the slogan "Je Suis Strasbourg" ("I am Strasbourg") to show solidarity with the victims of the attack. The slogan evokes the "Je Suis Charlie" motto used by supporters of freedom of speech after a 2015 attack in which 12 people were killed at the French satirical weekly newspaper Charlie Hebdo. Associated Press writers Samuel Petrequin, Raphael Satter and Angela Charlton contributed.